I opted for hardware driven sleep mode (SM=1) in the XBee. I felt that that cyclic sleep mode (SM=4) to be a pain to setup. I felt that that keeping the XBee asleep for extended durations, the device would be MIA from host. With a hardware based sleep, I could use a swith to to force it awake, configure remotely with the software tool I wrote, flick the switch back to the timer based sleep. Simple in my mind. The resulting solution must run on batteries (coin type ideally) and I wanted to get a sense of the operating time between battery changes. The spreadsheet utilized the cells in red as variables. Assuming a wake up during of 30ms and sending a sample every 100 seconds, I can run for an acceptable amount of time. The problem occurs when I include a 78L33 level converter, 555 timer, and a sample sensor like the LM35. I will need to look into this as this might be a show stopper on the battery only constraint. So now that I have the latest firmware installed on a coordinator, router, and 2 end devices all set up for PAN ID=47, it is time to write some software to experiment with the other settings. I am not a fan of the X-CTU software and decided to write a simple test application to configure my devices. 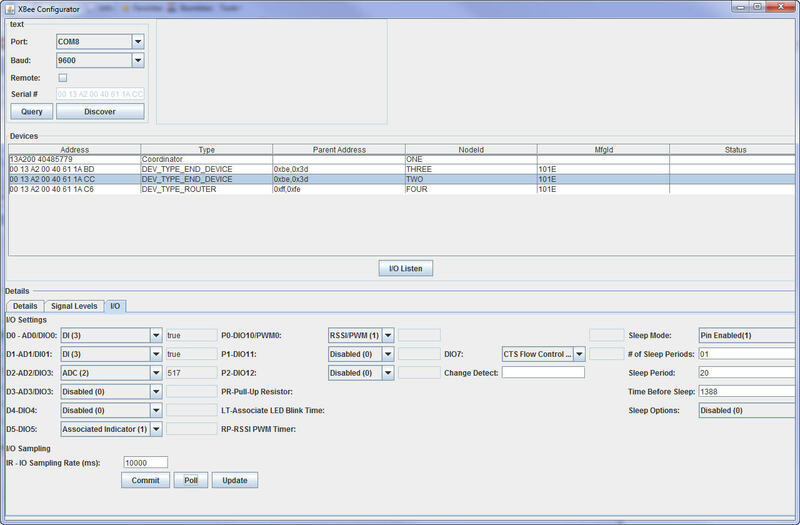 The vision is to use X-CTU software to upgrade the firmware, set the API mode, and Pan ID. After that, the rest of the provisioning would occur from the software I wrote to configure the devices. I want to commission new XBees for the “field” with just a few clicks of a mouse. I tend to forget things after a while so tacit information should be captured in the software. 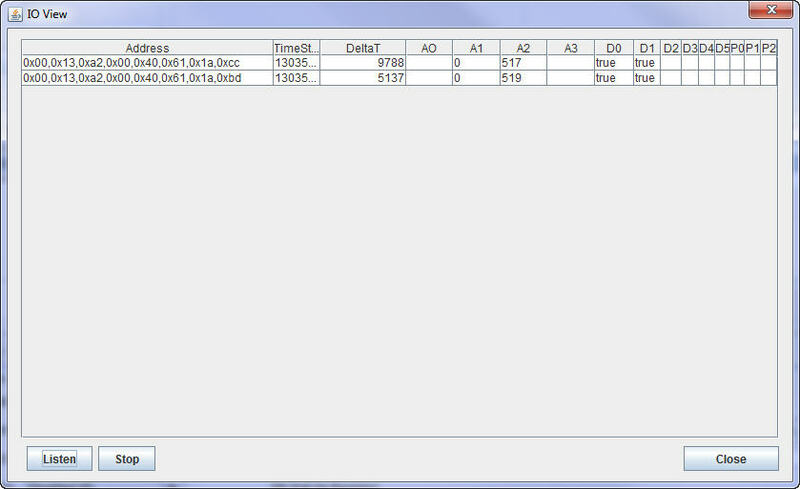 I used the Java API for Digi XBee/XBee and jformdesigner within Eclipse to write a simple application as shown below. 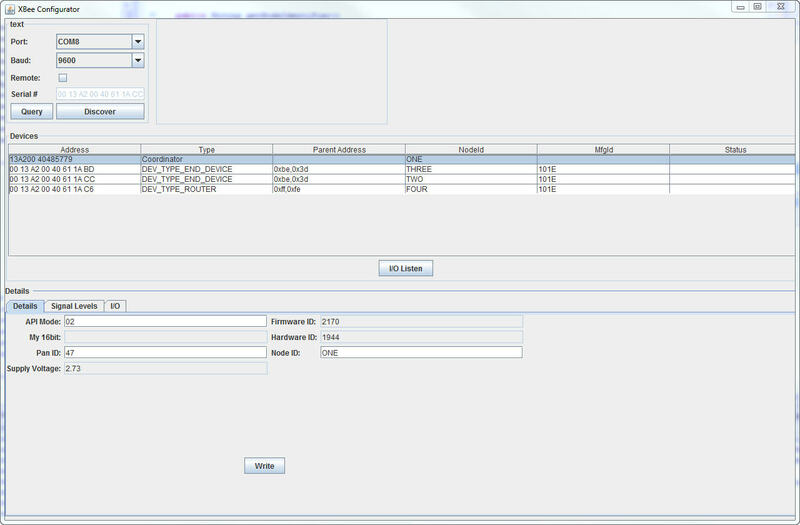 The software I wrote allows me to discover devices and drill down a given device to change parameters. I also needed a way for me to experiment with I/O settings and sampling modes as well. 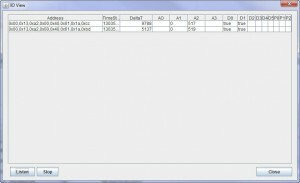 This allows me to configure a device and poll the data values. The XBee sheet I use is found here. In the end, the goal is to have the end device send their values after a sleep time so I added a listen that posts IO from end devices along with deltaTs between samples.